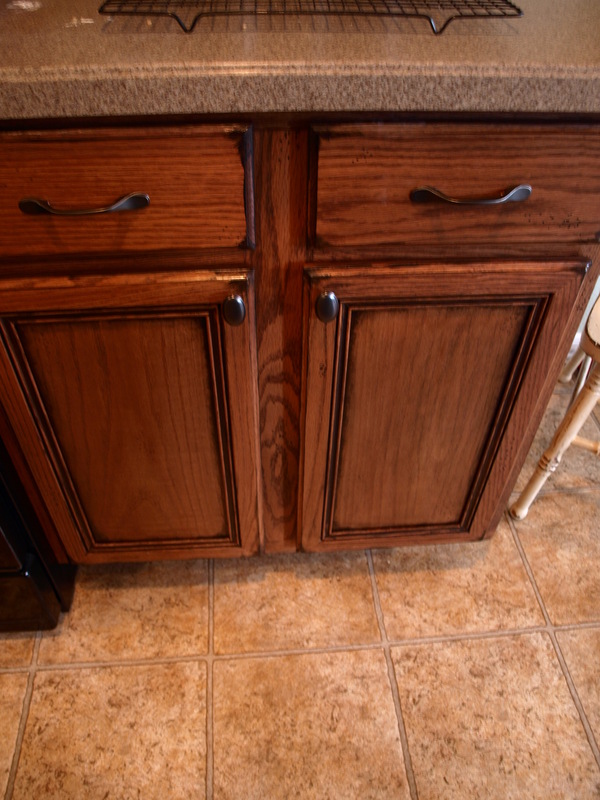 A friend of mine tried to update her honey-oak cabinets with a dark espresso gel stain. No bueno. I have never worked with gel stain before but from what I’ve researched it seems like a fickle medium. Anyway, I’m not sure if it was the way my friends applied the stain or if it was the type of finish that was on the oak cabinets before but the stain went on blotchy and, once dry, immediately began chipping off with the slightest touch. They were in a pickle so they called me up to get my opinion on the matter. I went over and took a look at the cabinets and got a handle on what had been done. We then came up with a plan of action to get their kitchen looking lively and updated again and I explained how to paint and antique cabinets for a shabby-chic, french country look. Then they got to work stripping and sanding the cabinets back to bare wood. BIG JOB but worth it. If you are reading this post with your own cabinets in mind I should tell you that stripping and sanding back cabinets to bare wood ISN’T ALWAYS necessary if you’re planning on painting them and/or refinishing them. In the case of my friends, we had to strip the gel stain away because you never want to paint on top of a coat that was never correctly bonded to the original cabinets surface. So basically, and I’m not an expert so you might need a second opinion depending on the state of your cabinets, if you have chipping finish (stain, laquer, paint, etc.) 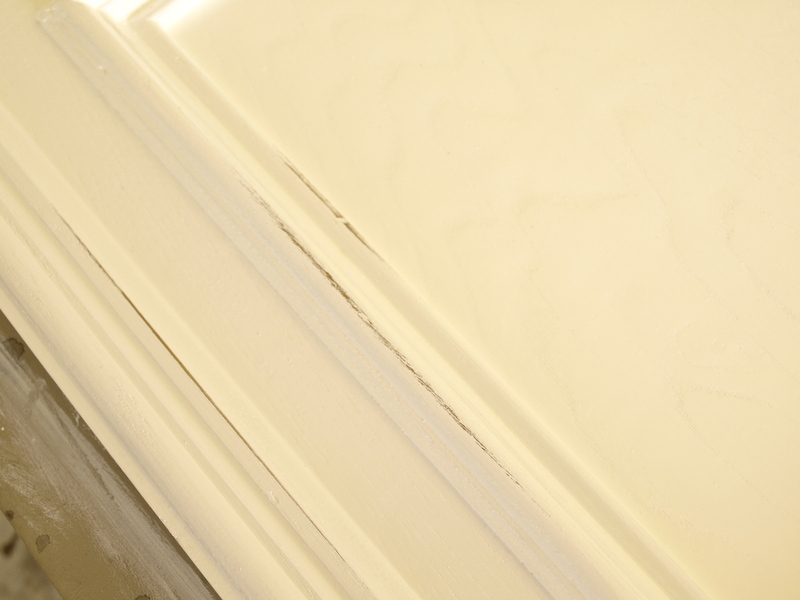 stripping and sanding are usually necessary before refinishing. 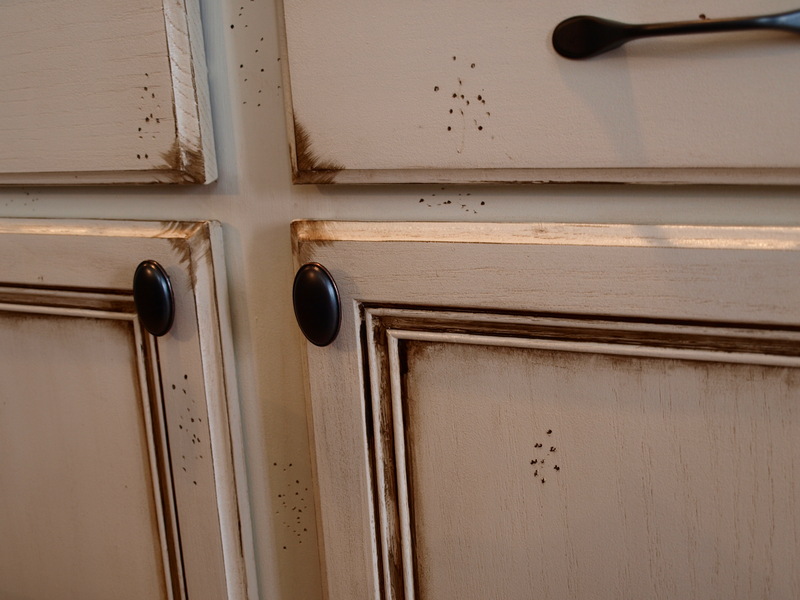 If your cabinets are in good condition (no chipping finish, bubbles, drips, etc.) a light sanding with medium grit sandpaper (just to give the existing finish some tooth for the new stain/primer to hold on to) should do the trick just fine. On my cabinets (we had standard builder grade oak cabinets when we first moved in that I wanted to “jazz up”) I simply went over them lightly with sandpaper and then antiqued and stained them with a stain 1 shade darker than the original finish. Heres the before and after (sorry the pics aren’t great). If you are going to stain over pre-stained and laquered cabinets without stripping them, you should only apply a new stain that is one or maybe two shades darker than the existing stain. Also, keep in mind that if you have any “fake wood” (mine have fake wood on the sides of that cabinet shelving) this will not “take” the stain like wood so if you go more than a shade or two darker you will have to most likely replace those areas with new “fake wood” to match the new stain. I stained over my fake wood with the same new stain I used on my cabinets and it blended in fine since I didn’t go much darker than the original color. So how’d we do it? I brought home a couple of doors as a demo for you guys. Primer: Ask a pro or get a recommendation from the sales associate depending on the state of your cabinets. There are tons of great primers out there. I used Behr primer for these. Paint: Interior latex paint in semigloss. The semigloss finish helps the stain go on smoothly and creates an easy-t0-clean surface for future wipe-downs. Sandpaper: Medium grit and fine grit. Stain with a polyurethane coating built in. This will eliminate the need for an additional laquer coat and seal the areas that have been sanded back. *TIP* Buy a stain that is darker than your paint color. For example, for an antiqued cream finish I bought white paint, and a medium brown stain. 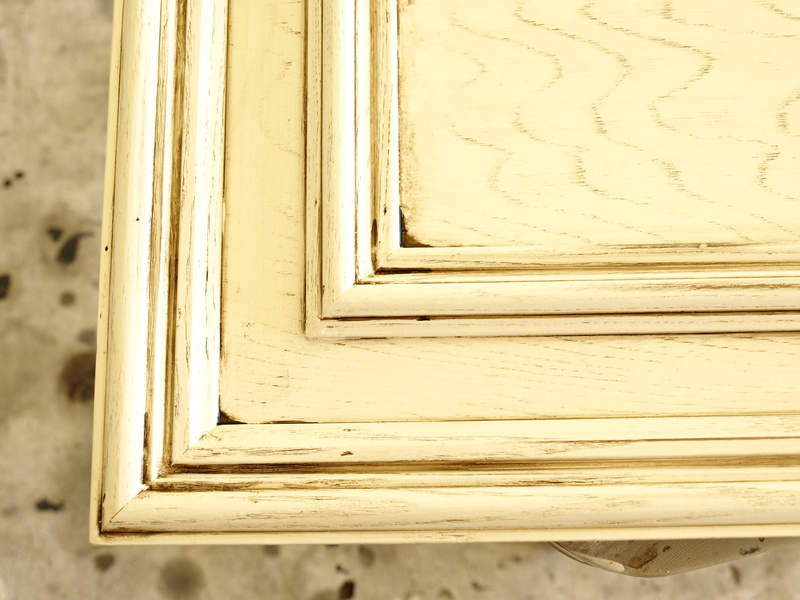 The stain gets into the corners for the antiquing and creates a soft variated wash over the entire cabinet turning the cabinet cream. Realize when you are buying your paint and stain that for this technique that the stain will darken and dull the paint color. So, buy a paint that is lighter and brighter than your intended result and a stain that compliments it. If you are nervous, just buy some sample paint colors and a stain and test out the technique on some scrap wood until you find the color combination that you like. Good paintbrushes. You want the cabinets to have as little paint strokes as possible so find a couple of great paintbrushes with fines, soft bristles. 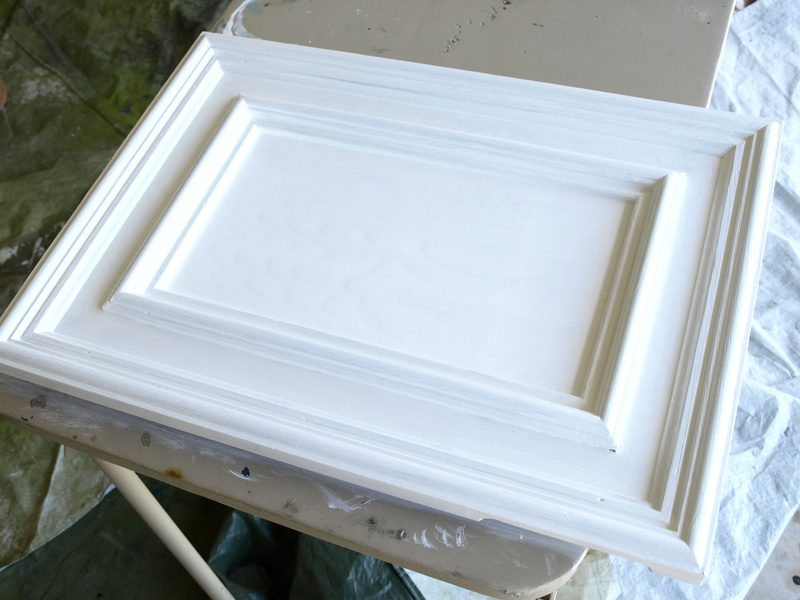 If you have decorative moulding, get a 1″ angled brush to get in all the corners and a 2″ flat brush for the flat surfaces. A sponge. They have different size sponges in the paint section of your local hardware store. I got a big one and cut it up as I needed. Blue heavy duty paper towels. Find them in the paint section as well. You will use these to wipe off the stain when you do the antiquing. 1. Prep your cabinets. This might mean stripping them and sanding them down to wood (as mine are), or simple hand-sanding them with a medium grit sandpaper. Thoroughly wipe down the cabintes with a damp cloth to remove excess dirt and debris. 2. 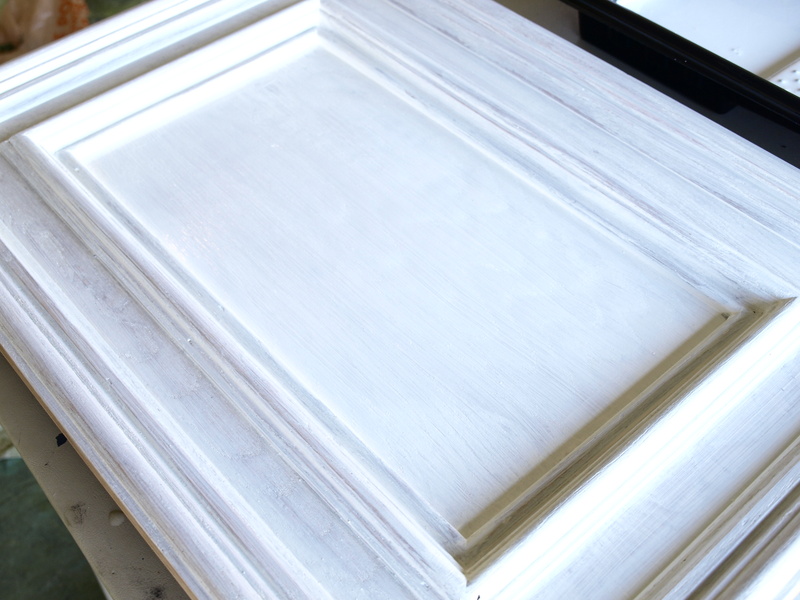 Begin priming your cabinets. 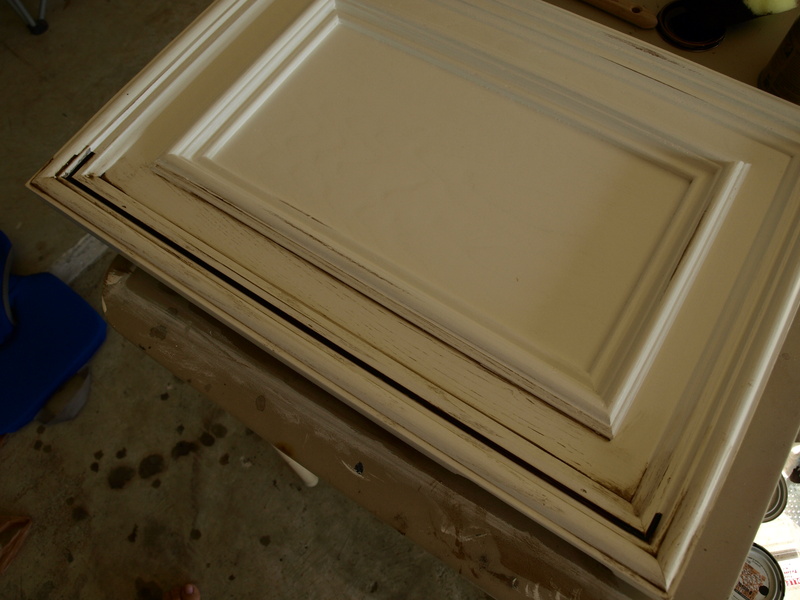 If your cabinets have decorative moulding (like these), take a small angled brush and prime the moulding first being sure to get in the corners, follow the woodgrain as much as possible, and being careful of drips and puddles. 3. 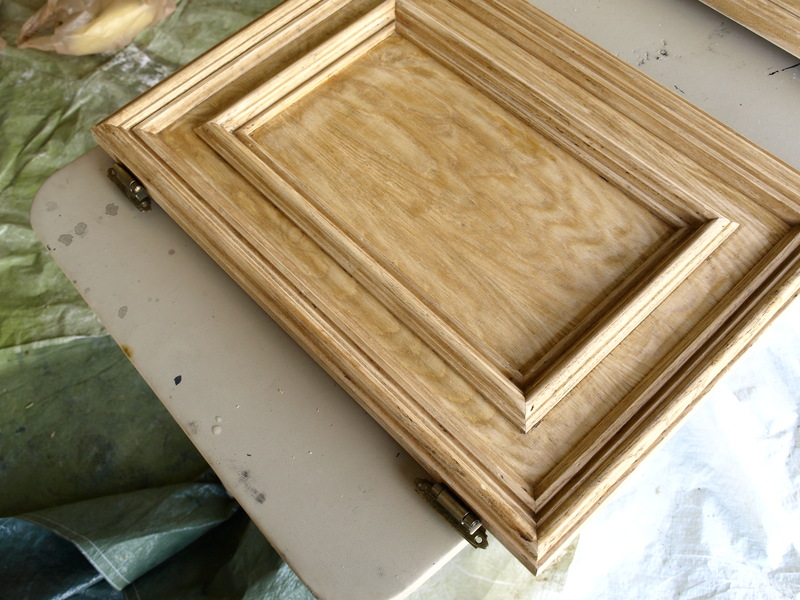 Next prime the flat surfaces with the flat brush, following the wood grain as much as possible. Try to keep your strokes as steady and straight as possible and be sure not to overload your brush with paint. 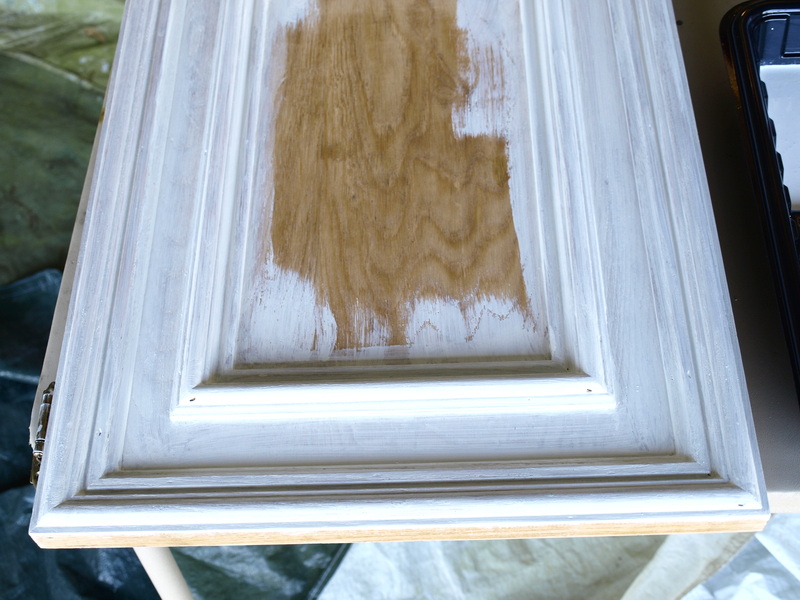 Also, be careful not to over-brush your cabinet; the primer is typically quick drying and will quickly develop a skin that may be hard to smooth out if over brushed. Also, always prime and paint in a well-ventilated area and keep out of direct sunlight. 4. Once the primer has dried, paint the first coat of paint color onto your cabinets. Follow the same painting style as with the prime: moulding first, flat surfaces second, follow wood grain, straight strokes, don’t overload, don’t over brush, etc. If you are seeing more prominent brush strokes than you would like to, don’t worry. Just paint the cabinet up and let it dry. If you need to you can “buff” out some of the heavy brush strokes with fine grit sandpaper in between coats if you need to. 5. Let the first coat dry. Survey the cabinets for drips or heavy brush strokes. If you see any that bother you, lightly “buff” them out with fine grit sandpaper. 6. Apply the second coat of paint the same way as the first. 7. Allow that coat to dry and do any touch-ups as needed. 8. If you’d like to do some distressing at this point you can. 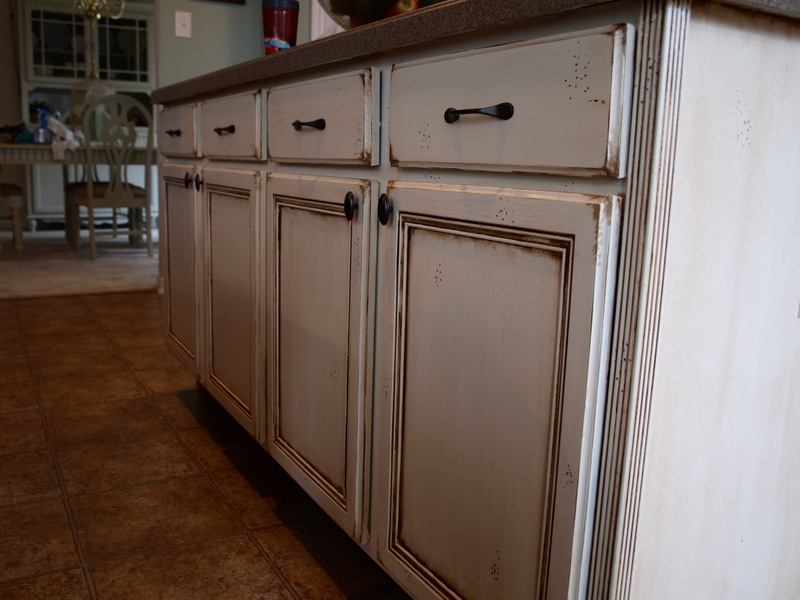 Lightly sand back to the wood edges, corners, grooves, of your cabinets until they are distressed to your liking. 9. Now comes the fun part! Get out your stain, sponge(s), and paper towels, and disposable gloves. Cut a medium sized wedge shape out of your sponge (this will help get the stain in the grooves). Open up your stain and get ready to work fast. (If this intimidates you, practice on a scrap piece of wood until you are familiar with the technique and timing). 10. Dip the end of your sponge into the stain and quickly apply it to one side of the cabinet. Make sure to squeeze the stain into all the grooves and corners. Only do one section at a time as this stain will set up fast and you need to be able to focus on one area at a time to make it look right. Be careful not to overload your sponge with stain. You want it damp, not dripping. 11. Now that one section is covered, pull off one paper towel and fold it into fourths. Firmly press the paper towel onto the stained portion of your cabinet and begin wiping off the stain, following the wood grain as much as possible. If you see too much stain puddling in the edges, use a corner of your paper towel to sop up and evenly distribute the stain throughout that area. 11. Do the remaining sides of the cabinet the same way. *TIP* If the stain starts to dry too early for your liking, re-wet your sponge with a little more stain and work it into that area. 12. Do the flat surfaces the same way, following the wood grain and blending the stain in to the stained sides. 13. Let the newly stained cabinet dry overnight. Then do the insides the same way. And thats it! Gorgeous eh! I’ll get pics when my friends kitchen is complete! 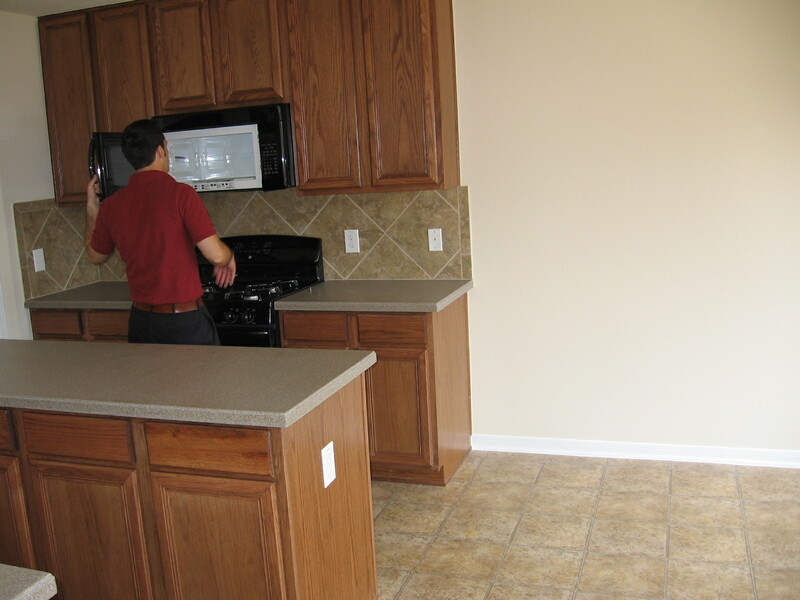 See Sue’s Refinished Kitchen here. How did you go about making the worm holes as they call them? I don’t see any in the pictures after you finished staining/antiquing the doors but once they are on the cabinets I see holes in various places. Do you use an ice pick or what? What color paint did you use? I am doing a china cabinet and would love for it to turn out exactly like your cabinets! There are too many cream colors to choose from!!!!!!!! I wish I could remember. I’m thinking it was just a pretty basic white. The stain is what makes it look cream when its completed. 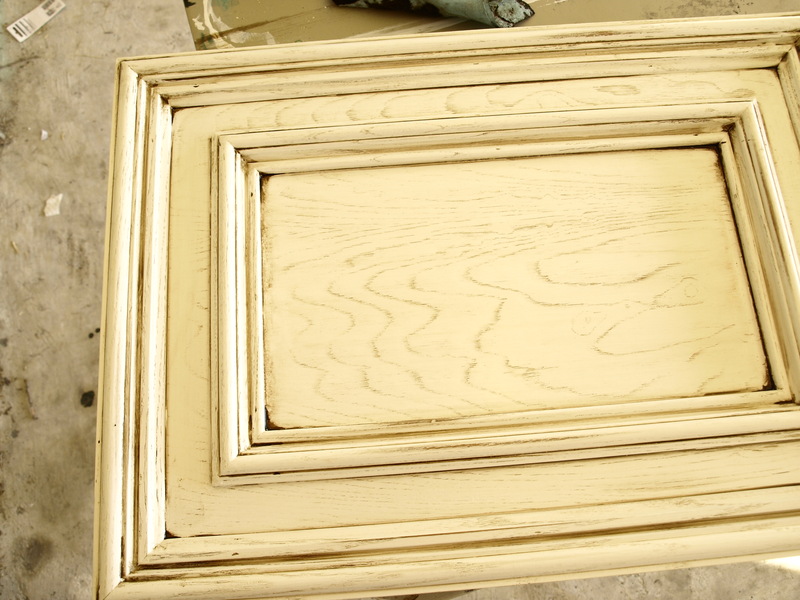 If you start with a really creamy paint color, it will get even more dark and creamy after you stain over it. You need to keep this in mind when picking paint. I really think I just went with a basic white, maybe with the slightest tint of cream but definitely more white than cream. Sorry I don’t have the specific color! Good luck! OMG, I have been all up in the air about what I want to do to my cabinets, and these are perfect. I am going to start on my kitchen in the spring. 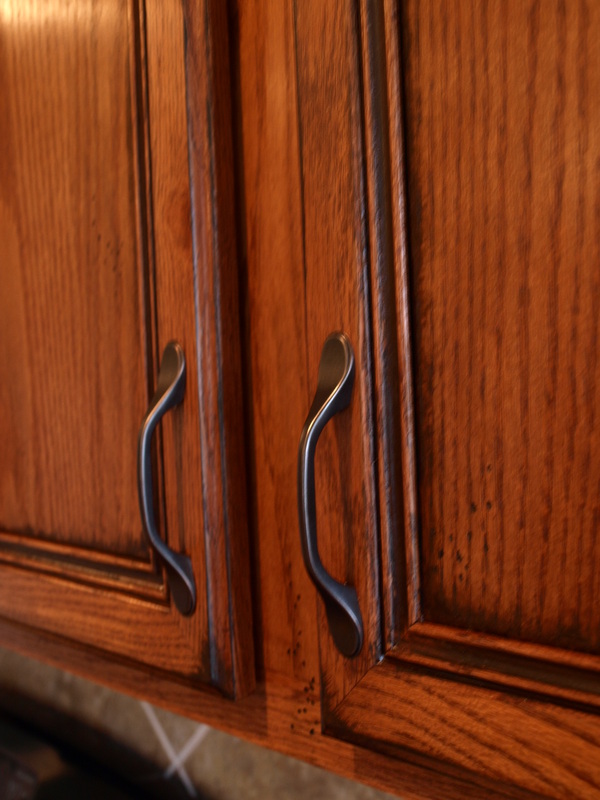 I have only one question, After you put the stain on the cabinets, did you put a clear coat of any type on the doors to protect the stain from coming off when cleaning a cabinet door if something is spilled on them? I was so excited when I found this how to online. I was at the just painted antique white and not loving the look. Was wanting the antique look. I had some walnut Miniwax stain and seal. So I followed what you did. Problem being the stain would not dry still tacky after two days. . I called around to the local paint stores. All said I needed to sand them down again. Arrghh wasnt up for that. I did try an acrylic matte spray that I had on hand from coasters I had made. Seems to have done the trick. Just hope they dont end up chipping or somethnig. Not sure where I went wrong. Oh bummer! I don’t know what could have happened. If you’re worried about chipping, you could try applying one coat of rub on poly finish. That might keep chipping at bay. Good luck! How did you stain or paint the island? First I lightly sanded the island down with medium grit paper. Then I used a primer in white and primed the island. After that I painted the island with a white enamel paint. That took a couple coats if I remember right. Then I stained over the top of the white paint with a polyshades stain by minwax. I had to work fast and apply the stain with a big sponge, letting it seep into the corners and crevices and then wiping off the excess vigorously. 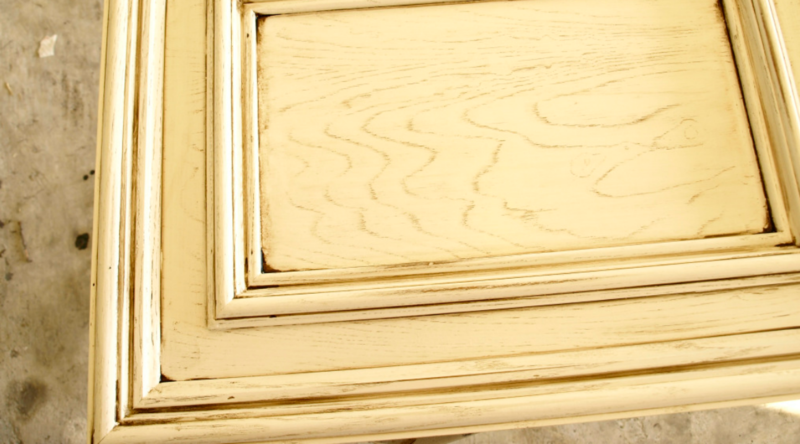 The stain created that antique look and turned the white paint more of a variegated cream color. That was about it. Hope that helps!